When the Pharisees heard that the crowds were whispering [that Jesus must be the Messiah], they and the leading priests sent Temple guards to arrest Jesus. But Jesus told them, "I will be with you only a little longer. Then I will return to the one who sent me. You will search for me but not find me. And you cannot go where I am going." The Jewish leaders were puzzled by this statement. "Where is he planning to go?" they asked. "Is he thinking of leaving the country and going to the Jews in other lands? Maybe he will even teach the Greeks! What does he mean when he says, 'You will search for me but not find me,' and 'You cannot go where I am going'?" So often we find ways to put off doing the right thing or make excuses for not responding to God in the proper way. I don't know how many times I've seen a husband or wife get serious about his or her marital commitment too late to make a difference. Opportunities to live for Jesus vibrantly and passionately can pass us by each day while our hearts grow callused. One day, there will be no more opportunities. Our hearts may grow hard, our bodies may grow too weak, our circumstances may degrade, or our influence may be lost. "I will be with you only a little longer," Jesus told the Temple guards in today's verses and also reminded his disciples another time (John 13:33). Many missed the joy of Jesus' life because they found reasons to put off responding or found excuses to reject him. 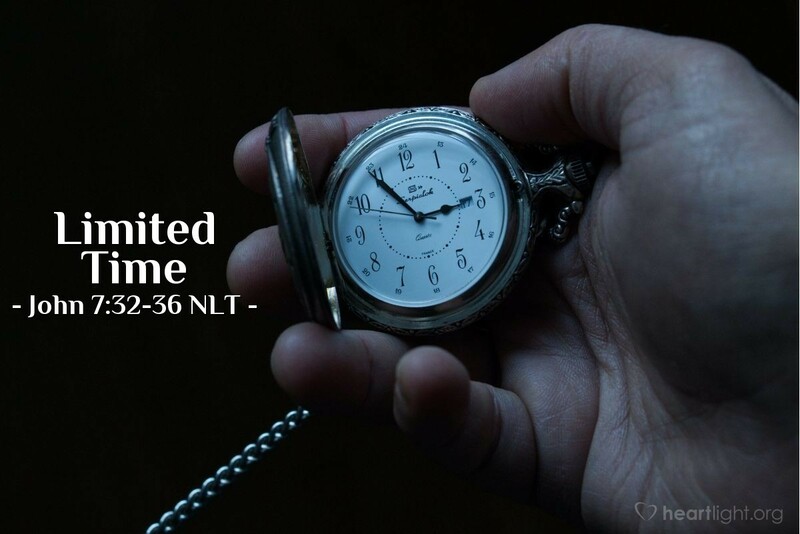 Let's not be guilty of wasting a limited-time offer — limited not because Jesus will withdraw the offer but because we each have only a limited lifespan. Instead, let's respond to Jesus with passion today before our hearts grow cold or our time runs out. LORD and Father, give me a sense of spiritual urgency about the decisions I make each day. Give me a clear sense of what is at stake in what I choose, reject, or put off. Give me the wisdom to see through all the distractions that can clutter my view and mislead my heart. Give me a holy passion to do what you want me to do. I don't want to waste a day of my life as your servant. In Jesus' name. Amen.